After being released from Craig Hospital, world renowned for spinal cord and brain injury rehabilitation, author Kimberly Faye began writing. ?This book began as therapy and developed into something so much greater,? she says. 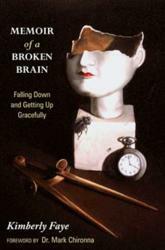 In her new ?Memoir of a Broken Brain: Falling Down and Getting Up Gracefully? (published by WestBow Press) she recounts her tale. Incapable of speech when she began, Faye?s story is a model of triumph of adversity. ?Memoir of a Broken Brain? is Faye?s story of surviving three accidents ? in two months ? that caused a life-altering traumatic brain injury. Readers will journey with her through the impasse of a broken brain, and experience her courage and determination to embrace her new identity and overcome obstacles from her past. Kimberly?s quest for survival sent her in search of the missing pieces of her past. She learned that survival is a multifaceted anvil that shapes our decisions and forges our future. Merely existing then becomes a double-edged sword: you may have managed to keep breathing, but are you really living? The only way for survival to triumph is to acknowledge the role of fear in the face of crisis: affirmed fear liberates; coddled fear incapacitates. Denial keeps us stuck! ?Life is an obstacle course,? Faye reminds readers, ?that provides an opportunity to face challenges and achieve goals. There are times when it seems the odds are stacked against you. When you are faced with loss, be it physical and/or emotional health, financial security, divorce, or death, how will you face the obstacles in your life?? 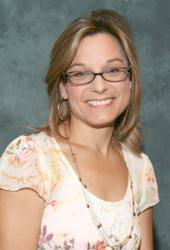 Kimberly Faye is an acclaimed orator and author. She has been featured on television and radio, and in magazines and newspapers. Faye is an expert at overcoming tragedy and casting vision for new beginnings. She resides in Colorado Springs, where she enjoys hiking and outdoor activities. She has two children and three grandchildren. A minister?s daughter, she has served in church planting and grassroots ministries. Her experience and training inspired her to create Find Your Shine, a service designed to assist others in finding their own uniqueness. Author Rick Richards introduces his new book ?Simply God: Gods Messages of Love and Encouragement? as “? no ordinary book. It has no beginning, middle, or end. The first 10 chapters are telling us what we need, to be children of God and be like Jesus. The last 14 chapters are single devotionals, which are God thoughts; to love and encourage his children to finish the Great Commission.? Unlike pastors and evangelists, who Richards believes are forced to rush toward ideas and plans designed to get their listeners to ?change their lives now!? rather than contemplate change, Richards ask readers to remember that equipping and preparing means giving one the tools of the trade. ?That is living God?s Word and how to plan to do this. The Word teaches that pastors are to equip the servants. All that time convincing and not equipping is destroying God?s world. Jesus equipped and encouraged God?s children and changed the world. What is our excuse?? Richards is certain, despite his own past mistakes, of God?s presence. ?I ran a motorcycle into a house. I hit headfirst at 60 mph and never broke a bone or had a bruise. God was there. In a car accident that left nothing of the jeep I had no broken bones or a cut or bruises. God was there. I fell 18 feet off a ladder onto my head and heard my neck snap. God was there.? Richards believes everyone needs to divert all their mental and physical abilities to become like Jesus. ?It is not luck that gets us through suffering and hard times,? he says. ?Luck is an imaginary thought process that makes your mind a slave for pleasures you may not receive. Rick Richards lives on an orchard in southern Ohio with his wife of 41 years. They have two kids and two grandkids. Richards struggled for many years trying to understand God?s plan for reaching the kingdom. He knew that the Word was the answer, and God had to make it simple. Richards was saved when he was 12, and he knew who God was, but at 18, he was lost and confused. He had no idea what he wanted to be. God finally sat him down the hard way and gave him two choices. 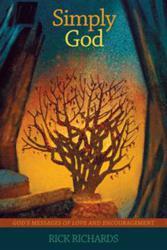 Richards has been writing God?s messages for more than 20 years and never knew why until now. Q&A: Is Islam the fastest growing religion in the world, should Christians be worried? Question by Joey: Is Islam the fastest growing religion in the world, should Christians be worried? Is Islam the fastest growing religion in the world, should Christians be worried? The following table has been quoted as taken from the 2005 Encyclopædia Britannica. Its figures for percentage growth come from the 1990 to 2000 version of the World Christian Database given above. By all the reliable sources, Islam is the fastest growing religion in the world. It has been verified by many independent sources, many of which are listed below. Therefore, as verified by indepedant news media, western sources and even by the christian organisation itself, Islam is indeed the fastest growing religion in the world. By percentage growth the fastest growing religions in the world are the smaller religions. This is because with a smaller sample size, every additional adherent accounts for a higher percentage increase. 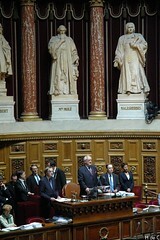 Therefore, by percentage growth we are uncertain what the fastest growing religions in the world are. However, logically speaking with statistics in mind by percentage growth the larger religions including Christianity (2.2 Billion Adherents), Islam (1.3 Billion) and Hinduism (900 million) are the least likely to be the fastest by percentage growth. An example to illustrate this point is Deism in the United States of America. Although in the period of 1990-2000 it experienced a growth rate of 717% the amount of new followers was very small and the large percentage increase is attributed to a smaller sample size. The alternative measure for fastest growing religion in the world is growth by the number of new adherents. That is, the religion to gain more new believers each period would be the fastest growing religion. As it stands the fastest growing religion by this measure is Christianity. Using the most up to date figures we determine that on average in 2007 Christianity gained 7-8million more adherents than any other religion (i.e. Islam, followed by Hinduism at 17million less). In conclusion, the fastest growing religion by percentage growth is unknown as smaller religions are not usually account for. By number of new adherents per period Christianity is the fastest growing religion. A side note, any argument that a religion is true because it is the largest or fastest growing is a logical fallacy. 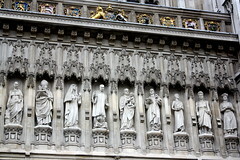 The amount of adherents or growth rate does not imply validity. Deists or Deism by 717% which was the religion of most founding fathers of USA. Taken from Sullivan county website. According to the ARIS survey, “deity” at a growth rate of 717 is not the fastest growing. “Wiccan” (for example) had a growth rate of 1,550%. In America it was Wicca. By number of new adherents Christianity is the fastest growing religion in the world with 30,360,000 new adherents annually (from 2000-2005). This is followed by Islam with 23,000,000 new adherents annually and Hinduism at 13,000,000. No, we should not care. WestBow Press, the strategic self-publishing division of the world?s largest Christian publisher, Thomas Nelson, Inc., announced legendary Indianapolis Colts head coach Tony Dungy has written the foreword for Hunter Smith?s new book, ?The Jersey Effect?Beyond the World Championship Ring.? By utilizing real-life NFL stories and biblical principles to demonstrate how a player?s behavior both on and off the field can have profound effects on fans and young players, ?The Jersey Effect? presents a powerful and unique commentary on the world of professional sports. The principles contained in ?The Jersey Effect? are reflective of the four core elements Tony Dungy believes must be developed to build socially responsible players and a functioning team: athletic ability, academics, social responsibility and spiritual understanding. The book uses true stories from notable Indianapolis Colts figures including, Jim Caldwell, Clyde Christensen, Jeff Saturday, Ben Utecht, Justin Snow, Dylan Gandy, Matt Giordano and Tarik Glenn to demonstrate how important it is that players remain conscious of those principles, both on and off the field. ?The Jersey Effect? is currently available as an eBook and is available at the WestBow Press Bookstore. Look for it in both hard- and softcover formats at leading book sellers later in the spring. For more information about self-publishing opportunities with WestBow Press please visit http://www.westbowpress.com. WestBow Press is a strategic self-publishing alliance of Thomas Nelson, Inc., the world?s largest Christian publisher, and Author Solutions, Inc. (ASI) ? the world leader in the popular self-publishing industry segment. Through this partnership, authors benefit from the rich publishing heritage of Thomas Nelson and the speed-to-market advantages of the ASI self-publishing model. Titles published through WestBow Press are evaluated for sales potential and considered for publication under the Thomas Nelson imprint. Thomas Nelson, Inc. continues to ?inspire the world? with distribution of products in more than 100 countries worldwide. For more information, or to start publishing today, visit westbowpress.com or call (866)-928-1240. Follow us @westbowpress on Twitter for the latest news. Thomas Nelson, Inc. is the world?s largest Christian publisher and one of the largest trade publishers in the United States. The Company provides multiple formats of Bibles, inspirational books and digital content, with distribution of its products in more than 100 countries. Live Event Management, Inc., a Thomas Nelson company, is the nation?s leading producer of Christian live events. Thomas Nelson is headquartered in Nashville, TN. For additional information, please visit thomasnelson.com. Colts Championship Team Member Shines Light on ?The Jersey Effect? WestBow Press, the strategic self-publishing division of the world?s largest Christian publisher, Thomas Nelson, Inc., today announced it will be releasing the new book, ?The Jersey Effect? to coincide with this year?s Super Bowl being held in Indianapolis, Indiana. Co-authored by retired Indianapolis Colts? championship punter Hunter Smith and All Pro Dad Director Darrin Gray, ?The Jersey Effect? uses real-life NFL stories from notable Indianapolis Colts figures to demonstrate that a player?s behavior both on and off the field can have profound effects on fans and young players. In a recent WestBow Press interview with Smith, he talks about where the concept for ?The Jersey Effect? originated and why he and co-author Darrin Gray felt so compelled to share it with the world. ?We wanted to write a book that talked about the social responsibilities professional athletes take on when they choose to first put on that jersey, and how their choices and behaviors as a team member can have profound implications on the fans and young people that admire them and watch the sport,? said Smith. To watch the full interview with Hunter Smith, click here: http://www.westbowpress.com/video/The-Jersey-Effect.aspx. ?The Jersey Effect? will be available as an eBook at the WestBow Press Bookstore on January 27. Look for it in both hard- and softcover formats at leading booksellers later in the spring. For more information about self-publishing opportunities with WestBow Press, please visit http://www.westbowpress.com. Thomas Nelson, Inc. is the world?s largest Christian publisher and one of the largest trade publishers in the United States. The Company provides multiple formats of Bibles, inspirational books and digital content, with distribution of its products in more than 100 countries. Live Event Management, Inc., a Thomas Nelson company, is the nation?s leading producer of Christian live events. Thomas Nelson is headquartered in Nashville, TN. For additional information, please visit http://www.thomasnelson.com. Why do the JW’s, and some other christians always say “have you heard the good news”? Question by Buddhist_teen: Why do the JW’s, and some other christians always say “have you heard the good news”? Isn’t the “good” news that pretty soon two thirds of the world is going to hell? Only one third of the world is christian, so that doesn’t exactly sound good to me. I try to respect all other religions and lack there of, and I do, but hell is one belief I can’t bring myself to respect. So why is it “good” news? 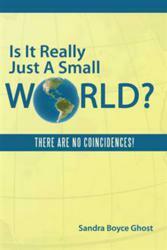 New Book Asks, Is It Really Just A Small World? In this not-your-run-of-the-mill autobiography, Is It Really Just A Small World? There Are No Coincidences! (published by WestBow Press), author Sandra Boyce Ghost takes readers on a journey through her life’s amazing story. She presents solid answers to the questions, are the coincidental happenings in life really happenstance? Is there something greater at work? ?To read it is to regard your own life through newly enlightened eyes,? says Ghost. Ghost chronicles her story as a teen trying to swim upstream in a troubled home life, who uses marriage as an escape from the parental river of alcohol. When physical abuse ends the first union, a second marriage promises all her dreams will come true until she finds herself desperately trying to win her new husband?s approval to no avail. In a fluke of circumstances, Ghost is thrust into singing onstage. This occurrence blossoms into a surprising career as a nightclub entertainer with bookings all over the U.S. and Canada, appearances on television and even a recording contract. Ghost says this is when the miracles began to happen. ?Is It Really Just A Small World? traces a significant pattern of coincidences, suggesting the intervening Hand of God,? explains Ghost. Through this story filled with glitz, glamour, tragedy, comedy, love, loss and redemption, readers will find excitement about their lives as they reflect on their own journeys. ?You will never look at a ?coincidence? the same way again,? says Ghost. The catalyst that launched Sandra Boyce Ghost?s writing career was winning the Guideposts Magazine Writers? Award in 1971. Subsequently, she has had four other books published, has been a newspaper columnist and editor, vice president of a public mining company and is currently vice president of a local chapter of Aglow International. She lives in Conneaut Lake, Pennsylvania with her noble German Shepherd, Kelly, and claims her greatest gifts in life are her children, four grandchildren and two great-grandchildren. Yet, she claims she hasn?t decided what she wants to be when she grows up!